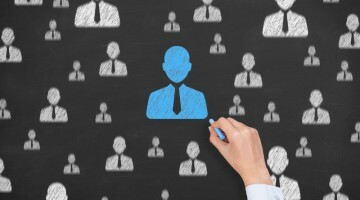 This week, we cover an award, a trade show announcement, a new hire and grand openings. This week, we cover the IDA Detailing Shop of the Year award, a trade show announcement, a new hire and grand openings. REDMOND, Ore. — Redmond’s Perfection Plus Auto Detailing won Detailing Shop of the Year at the International Detailing Association’s (IDA) annual awards banquet in Orlando, Florida, during this month’s Mobile Tech Expo — the largest international show for appearance and repair-reconditioning professionals in the U.S., according to a press release. The Detailing Shop of the Year award is presented to a detailing shop nominated for operating an outstanding fixed-location detailing facility, the release continued. 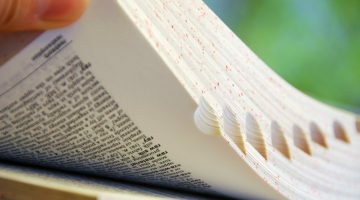 Nominations come from the IDA membership; however, the IDA Nominating Committee narrows the nominations down to three, and the final selection comes down to an open vote, the release noted. Perfection Plus Owner Shane Mayfield was also nominated for the Detailer of the Year award, the release added, and more than 100 Perfection Plus customers in the Redmond area voted for Shane and Perfection Plus. While Detailer of the Year will have to wait until another time, Mayfield thanks everyone who voted in both contests, the release stated. Mayfield has been on a roll this past year, chosen for the Air Force One Detailing Team at Seattle’s Museum of Flight and for the McCall’s Motorworks Revival & The Quail Detailing Team at Monterey Car Week, the release continued. 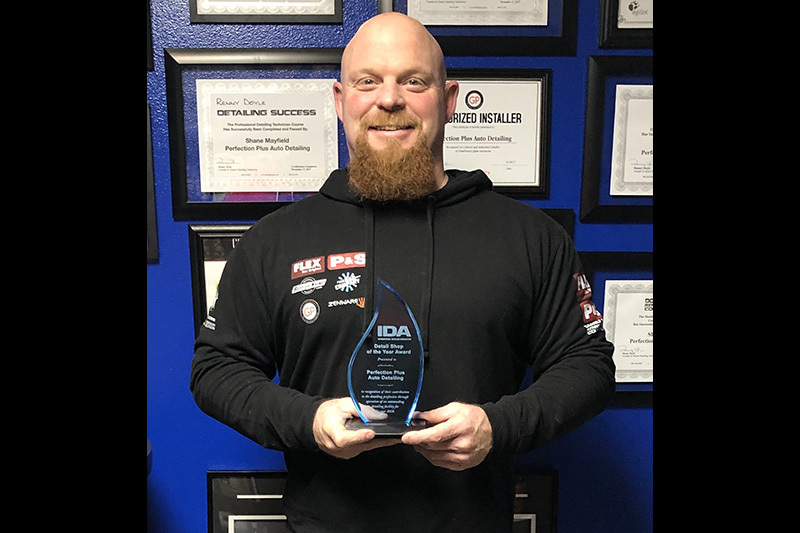 For more information about Shane Mayfield winning Detailing Shop of the Year, contact him at (541) 598-6193 or [email protected]. SAN ANTONIO, Texas — The Southwest Car Wash Association’s 2019 Convention & EXPO is slated for Feb. 24-26 in Arlington, Texas, and AutoBrite™ will be there at Booth 829 with its innovative unmanned modular park conveyor tunnel carwash system, ModBrite™, according to a press release. AutoBrite, a San Antonio-based company, has 50 years of experience in the U.S. in automotive chemical, detail products and carwash equipment manufacturing and distributing, the release continued. Now, for the first time ever, the popular ModBrite system is available in the U.S., and AutoBrite is the exclusive dealer of this system that has proven itself already in European and Asian markets, the article noted. “As an industry leader in the auto carwash conveying solutions marketplace, we are the only company to offer a park belt conveyor system in the world,” said Lawrence Stovall, owner of AutoBrite. Ideal for convenience stores and fueling stations where space is a premium, ModBrite offers all the benefits of an express tunnel in the space constraints of an in-bay automatic, the release stated. ModBrite is highly customizable to existing in-bay automatics, new express tunnel build outs and self-service carwash upgrades, the release added. Other recent additions from AutoBrite to the U.S. marketplace include: TriBrite, a three-way in-bay automatic; TouchBrite™, an in-bay automatic foam touch three-brush machine; and PrepBrite™, a pre-washer, the release concluded. 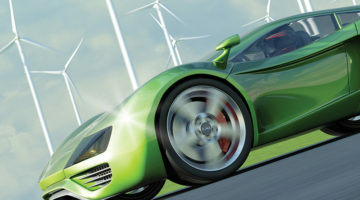 BIG BEAR, Calif. — Following an industrious 2018 international tour to demonstrate his Double Black car care products, Detailing Success’s Renny Doyle announced positive structural changes to his Detail Mafia board of directors and introduced San Fernando Valley detailer, Chris Woolman (CD, SV) of Octane Detailing, as his executive assistant, according to a press release. 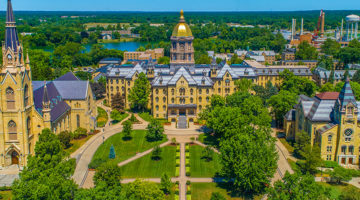 Woolman will be known as “Renny’s Hit Man,” and he will maintain Doyle’s calendar of events, coordinate projects and streamline communications for both Doyle and Doyle’s wife and business partner, Diane, the release added. A car collector and paint correction specialist in his own right, Woolman is certified by the International Detailing Association (IDA) and by Doyle’s Detailing Success, the release noted. He has a successful mobile detailing business in Reseda, California, and will continue to detail by appointment only, the release added. 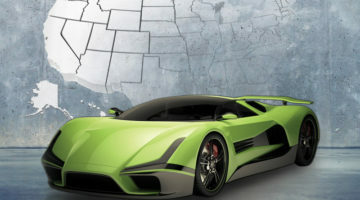 He will be splitting his time between Reseda and Big Bear, acting as a liaison between the Detailing Success membership, the Detail Mafia board of directors and Doyle himself, the release concluded. For more information about the Detail Mafia board of directors, contact Chris Woolman at (818) 564-5839 or [email protected]. KYLE, Texas — Alsco has announced the grand opening of its new Kyle, Texas, mixed laundry plant on Jan. 23, 2019 at 449 Vista Ridge Dr., according to a press release. The Kyle plant will serve the greater Austin, Texas area, and the new facility, which contains 96,000 square feet and sits on approximately 9 acres, will be able to process up to 100,000 pounds per day of linens and uniforms with 100 percent accuracy, the release continued. 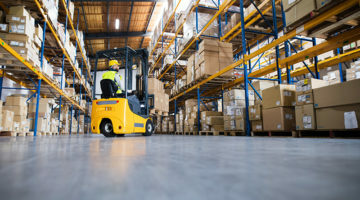 Although Alsco has served the greater Austin area for over 25 years, the new facility will allow Alsco to continue to grow its services in the area, the release noted. 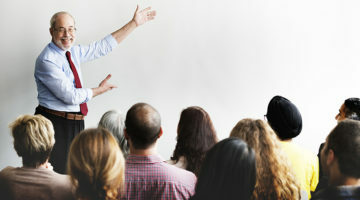 It will also bring a positive impact to the City of Kyle, where Alsco will employ 160 full-time employees to support its operations, the release stated. The facility also employs cutting-edge technology to reduce Alsco’s impact on the environment, including water and energy saving technologies, such as the Norchem water filtration system, which will allow the plant to reuse approximately 70 percent of its water and meet the city of Kyle’s wastewater standards, the release added. 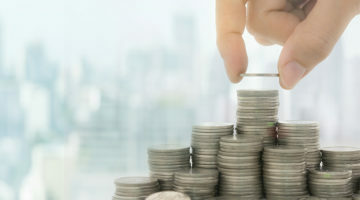 Alsco will also be contributing $200,000 to the city of Kyle to be used for improvements to infrastructure, such as the wastewater treatment plant, the release continued. 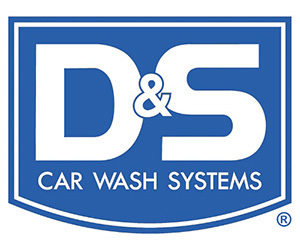 HERMISTON, Ore. — According to www.eastoregonian.com, Todd Perkins and Russ Greene, owners of Five Star Car Wash, have opened a second location at 1180 West Highland Ave. The carwash officially opened on Jan. 16th, and its winter hours are from 8 a.m. to 5 p.m., the article continued. 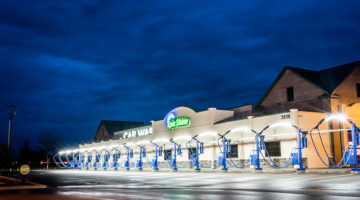 This carwash has new amenities that are not available at the first location, according to Perkins; the new Five Star Car Wash, features a self-serve station with dryers and triple-shine conditioner, the article noted. The tunnel carwash also has a show of LED lights, the article concluded. CHUBBUCK, Idaho — According to www.idahostatejournal.com, brothers Kyle and Travis Benson opened Pony Express Car Wash at 4500 Yellowstone Ave. on Jan. 5th. 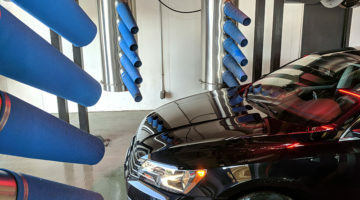 Kyle worked for 11 years in industrial water management, and Travis has worked the past six years in the carwash industry, the article continued; they decided to combine their skills to develop a water-saving carwash. The Bensons plan to break ground on two additional carwashes in the spring in Idaho Falls and Ammon, the article noted. Kyle estimates that the average driveway washing uses 120 gallons of water while Pony Express uses only 70 gallons per car, but the majority of it is recycled several times, the article added. Kyle developed a system with a series of underground tanks in which dirty water settles before it is pumped through a filtration system, the article stated; the water, though not potable, is clean enough for carwashing standards, and the company has ordered additional equipment to help reclaim an even higher percentage of the water. “We are working on new avenues to conserve more water,” Kyle said. 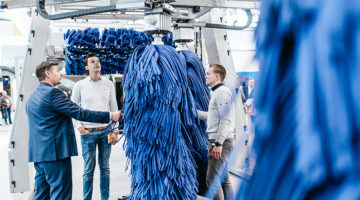 The length of the carwash also sets it apart from others: the conveyor is 230 feet long and passes through a 200-foot long building, allowing for more dwell time for the chemicals, the article noted. The Bensons chose the name Pony Express in both a nod to the speed of their express wash, comparing it to the historic Pony Express mail delivery service, and the Old West theme that they believe will resonate with the residents, the article continued. 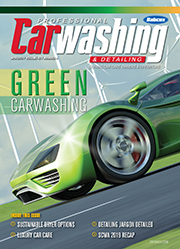 Prices at the carwash range from $8 to $16, and monthly wash passes are available from $19.95 to $29.95, the article concluded. 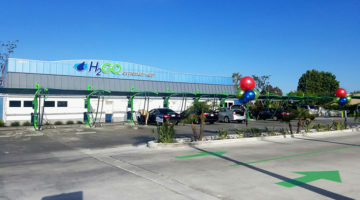 ROYAL PALM BEACH, Fla. — According to www.gotowncrier.com, Southern Palms Car Wash, a state-of-the-art express wash, opened at 11453 Southern Blvd. 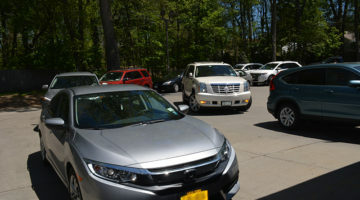 The carwash features a tunnel that will wash a car in five minutes as well as a variety of complimentary self services, such as microfiber towels, fragrances, vacuums, window cleaner and mat cleaners, the article continued. Daniel Woodward, owner of Southern Palms and a longtime business owner, engineer and serial entrepreneur, recently retired from a company he co-founded in 1991 and wanted to start a new venture, the article noted.